I’m still neck-deep in moving into a “new-to-me” house. Boxes are everywhere I look and the project list grows longer every day. Most for the new place and a few to ready the old for going onto the market to be sold. The new shop space still is just a glimmer in my eye, but I hope to be back up and running in the next few weeks. I’ve staked a claim on a back corner of the garage for my new shop space. I have to admit that it’s a little daunting to think about a new shop setup. Heck, I was just getting comfortable in my little shed. The possibilities can be a little overwhelming but when the time comes I think I’ll start with a setup as close to what I had as possible. One of the positive things is that I’ll have much more room. Not so much for a permanent setup, but in the case of larger projects, the room is there to spread out. More on that when the time comes. The only thing close to woodworking that I have done in the past few weeks was a wall project in the new house. 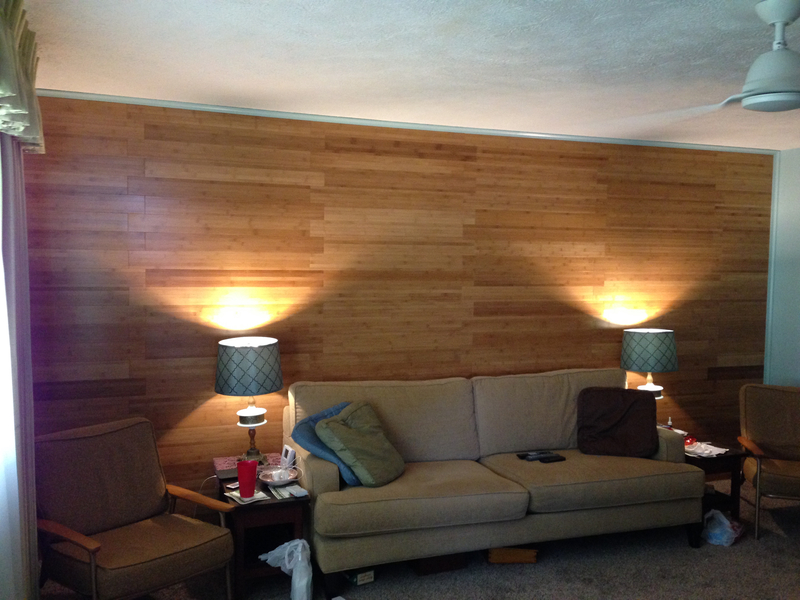 The house that we purchased had a wall of original paneling from the late 1960’s. Well maintained but the look was not to our liking. Many options were discussed and shot down one by one. Here is what we started with. 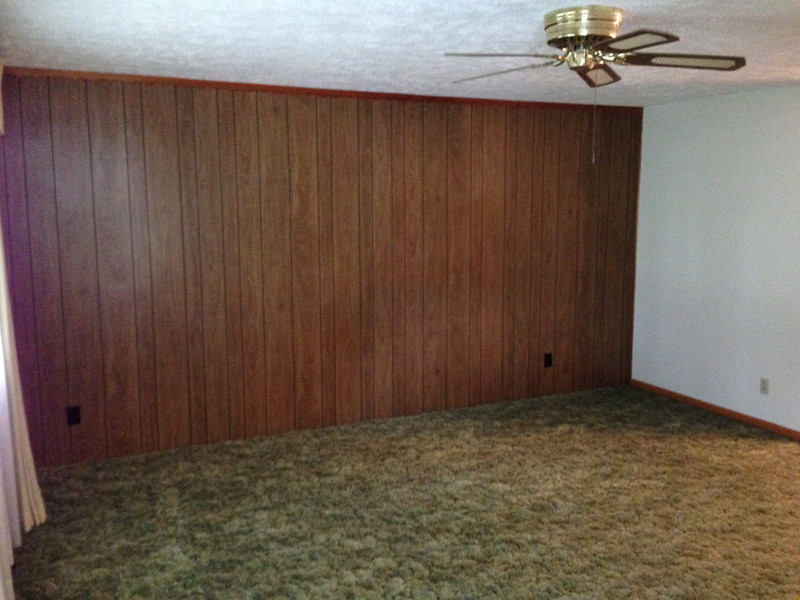 Yep, that carpet is on it’s way out too! In the end I turned to my old friend bamboo. No skewers this time, but tongue and groove bamboo flooring. Now brace yourself, I did it all with power tools. I had to buy a miter saw for cutting the planks to length and I already owned a pneumatic nailer. Construction work like this is much faster with power tools, hands down. I saw an example of this solution somewhere on the internet and choose to duplicate the look. I installed the flooring running horizontally with an overlapping “zipper” seam. After a little bit of mathematic cyphering, I installed the first row at the top of the wall. Taking care to keep it running level across the entire span. From there it was simple to install the planks with the pattern repeating every other row. To secure the planks to the wall I toe-nailed them thru their tongues into the wall studs. We like how it turned out, more importantly, the wife likes how it turned out, and its a great conversation piece for those stopping in to see the new house. Like I said, not exactly woodworking, but better than nothing. Well, back to unpacking boxes and crossing things off of the to-do list. Hopefully I’ll resume normal programming before too much longer. This entry was posted in Bamboo Wall and tagged bamboo, paneling. Bookmark the permalink. It involved tools, nails and wooden like objects – okay by me if you call it “woodworking,” although carpentry might be more correct. But then there is the school of thought that says bamboo is really a grass so you might call it “grassworking.” hummm. In any case it looks good. Qualifications: finish carpenter with grassworking experience. best of luck with the move Greg.wishing you all the best ,i was wondering where you had got to. Thanks Alex. More like checking in, won’t be too much longer until I’m back up and running though. Are you still in Mountaineer country? Yep. Actually only moved across town. A little more room and closer to everything. It looks great! I love that look but my wife doesn’t care for it as much. Believe it or not but that is what I wanted to do at the back of the garage but my wife considered it a “waste of money!!”. Thanks for making time to do the PS chair drawings!